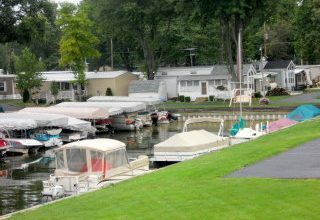 Marble Lake Resort & Marina is a year-round mobile home park and a docking facility on the..
Docks are In and Summer is Here! Docks are in! The water is high, but we are looking forward to a warm, “dry”, Memorial Day Weekend. We still have a few docks available, so if you’d like to enjoy your boat more this summer by having it in the water at all times, just call 517-639-4604 for your reservation.